Artist illustraton of a black hole consuming a neutron star. Image credit: Dana Berry/NASA. Click to enlarge. Scientists have solved a 35-year-old mystery of the origin of powerful, split-second flashes of light called short gamma-ray bursts. These flashes, brighter than a billion suns yet lasting only a few milliseconds, have been simply too fast to catch… until now. If you guessed that a black hole is involved, you are at least half right. Short gamma-ray bursts arise from collisions between a black hole and a neutron star or between two neutron stars. In the first scenario, the black hole gulps down the neutron star and grows bigger. In the second scenario, the two neutron stars create a black hole. Gamma-ray bursts, the most powerful explosions known, were first detected in the late 1960s. They are random, fleeting, and can occur from any region of the sky. Try finding the location of a camera flash somewhere in a vast sports stadium and you’ll have a sense of the challenge facing gamma-ray burst hunters. Solving this mystery took unprecedented coordination among scientists using a multitude of ground-based telescopes and NASA satellites. Two years ago scientists discovered that longer bursts, lasting over two seconds, arise from the explosion of very massive stars. About 30 percent of bursts, however, are short and under two seconds. Four short gamma-ray bursts have been detected since May. Two of these are featured in four papers in the October 6 issue of Nature. One burst from July provides the “smoking gun” evidence to support the collision theory. Another burst goes a step further by providing tantalizing, first-time evidence of a black hole eating a neutron star—first stretching the neutron star into a crescent, swallowing it, and then gulping up crumbs of the broken star in the minutes and hours that followed. These discoveries might also aid in the direct detection of gravitational waves, never before seen. Such mergers create gravitational waves, or ripples in spacetime. Short gamma-ray bursts could tell scientists when and where to look for the ripples. The Swift satellite detected a short burst on May 9, and NASA’s High-Energy Transient Explorer (HETE) detected another on July 9. These are the two bursts featured in Nature. Swift and HETE quickly and autonomously relayed the burst coordinates to scientists and observatories via cell phone, beepers and e-mail. The May 9 event marked the first time scientists identified an afterglow for a short gamma-ray burst, something commonly seen after long bursts. That discovery was the subject of a May 11 NASA press release. The new results published in Nature represent thorough analyses of these two burst afterglows, which clinch the case for the origin of short bursts. “We had a hunch that short gamma-ray bursts came from a neutron star crashing into a black hole or another neutron star, but these new detections leave no doubt,” said Dr. Derek Fox of Penn State, lead author on one Nature report detailing a multi-wavelength observation. Fox’s team discovered the X-ray afterglow of the July 9 burst with NASA’s Chandra X-ray Observatory. A team led by Prof. Jens Hjorth of the University of Copenhagen then identified the optical afterglow using the Danish 1.5-meter telescope at the La Silla Observatory in Chile. Fox’s team then continued its studies of the afterglow with NASA’s Hubble Space Telescope; the du Pont and Swope telescopes at Las Campanas, Chile, funded by the Carnegie Institution; the Subaru telescope on Mauna Kea, Hawaii, operated by the National Astronomical Observatory of Japan; and the Very Large Array, a stretch of 27 radio telescopes near Socorro, N.M., operated by the National Radio Astronomy Observatory. The multi-wavelength observation of the July 9 burst, called GRB 050709, provided all the pieces of the puzzle to solve the short burst mystery. Ricker added that the July 9 burst and probably the May 9 burst are located in the outskirts of their host galaxies, where old merging binaries are expected to be. Short gamma-ray bursts are not expected in young, star-forming galaxies. It takes billions of years for two massive stars, coupled in a binary system, to first evolve to the black hole or neutron star phase and then to merge. The transition of a star to a black hole or neutron star involves an explosion (supernova) that can kick the binary system far from its origin and out towards the edge of its host galaxy. This July 9 burst and a later one on July 24 showed unique signals that point to not just any old merger but, more specifically, a black hole – neutron star merger. 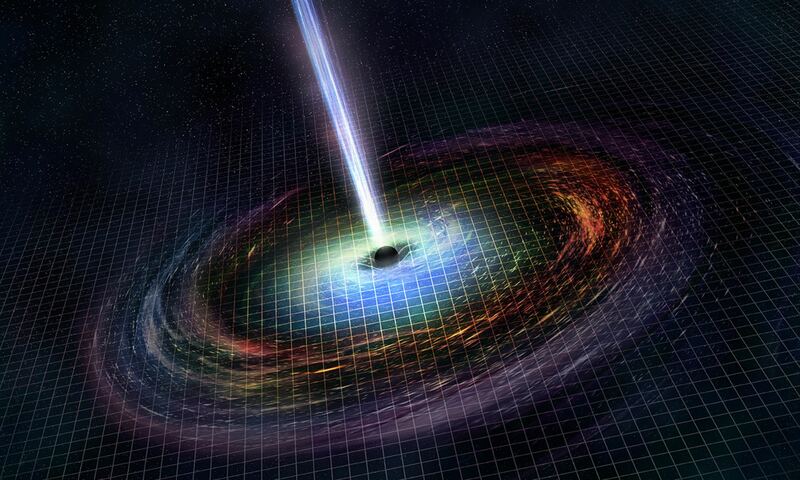 Scientists saw spikes of X-ray light after the initial gamma-ray burst. The quick gamma-ray portion is likely a signal of the black hole swallowing most of the neutron star. The X-ray signals, in the minutes to hours that followed, could be crumbs of neutron star material falling into the black hole, a bit like dessert. And there’s more. Mergers create gravitational waves, ripples in spacetime predicted by Einstein but never detected directly. The July 9 burst was about two billion light years away. A big merger closer to the Earth could be detected by the National Science Foundation’s Laser Interferometer Gravitational-Wave Observatory (LIGO). If Swift detects a nearby short burst, LIGO scientists could go back and check the data with a precise time and location in mind. A black hole – neutron star merger would generate stronger gravitational waves than two merging neutron stars. The question now is how common and how close these mergers are. Swift, launched in November 2004, can provide that answer.